A fight is like anything else produced in collaboration for the consumption of the masses. Hopefully, we can take things from them that make us better, in whatever form that takes. I could go on and on talking about memorable fights, and I’ll likely do a sequel to this at some point, but for now, here’s part 2 of “10 Fights to Show to a Non-Fight Fan”. If you didn’t catch part 1, you can find it here. Now, let’s talk about some classic hand-to-hand combat. “Minotauro” Nogueira was a grappler through and through, revered to this day for his mastery of Brazilian Jiu Jitsu. The man standing opposite him in the Tokyo Dome that night was the antithesis of that. Cro Cop was one of the most feared strikers in the world, possessing the deadliest kicks in the game. For the first ten-minute round Cro Cop picked apart Nogueira on the feet, sprawling whenever the Brazilian tried to execute a take down and fight the fight he wanted. Mirko even landed a nasty head kick at the end of the round, dropping Minotauro, who would be saved by the bell. In the second round, Minotauro wouldn’t wane in his insistence on having a good old grapple and would finally complete a take down. What followed was the former kickboxer Cro Cop drowning with the Jiu Jitsu ace on top of him, eventually surrendering the arm and capitulating to the referee. It’s a fascinating fight to see the early dynamic of striker vs grappler play out in real time. It should be clear after watching this why people simply had to evolve and get good everywhere. This also serves as an example of why in fact grappling is so important, and not just “stalling” or “pointless” as some might see it. One of the top biggest upsets in the history of the sport, this night down under saw the end to a historic title reign, and the start of a period of transition and growth for women’s MMA. Holm entered the fight as the underdog of all underdogs. Despite a stellar boxing career, she was very inexperienced in MMA. Rousey was the biggest star in the sport and was holding onto a shiny zero next to her twelve wins, six of those being UFC bantamweight title defences. The Olympic judoka was a monster, arm baring everyone put in front of her. When the bell rang, the odds, tale of the tape and public perception disappeared in the squall of reality. Ronda Rousey, being a high-level grappler, tried to stand and trade with an elite boxer in Holm. Her trainer, Edmond Tarverdyan, had long been saying that “the Rowdy One” had the hands to match any high-level boxer, and now was her chance to prove it. She didn’t and was subsequently cut down by Holly in the second round with a head kick. The crowd and commentary team, long caught up in the Ronda Rousey whirlwind, exploded in a chorus of shock and awe. The legacy of Ronda Rousey is a complex and dichotomous beast of a topic, so we’ll leave that for another time. But, the fall from grace started here, and likely could, and should, have had a far softer landing. I can’t think of a fight that better encapsulates the very idea of a classic fight. This five-round war has everything. From the ground, to the clinch, to the stand-up, it’s nothing but high-level work rate. Henderson and Pettis will go down as two of the best lightweights to ever put on a pair of four-ounce gloves, and they painted their Sistine Chapel as a duo. Of course, there’s the “showtime kick”. If you don’t know what I’m talking about, do yourself a favour and don’t google that. Just watch the fight and see if you can guess what the “showtime kick” is when it happens. I could write an entire piece on why Nick Diaz is such an essential part of the sport; in fact, I did. This fight, however, works as a good introduction to Stockton’s favourite son. Most times, when you sit down to watch an anticipated fight, you want it to go a decent amount of time. This battle completely eschews that desire, only lasting four minutes and fifty-three seconds, and believe when I say that’s all you need. Bell to bell, this was chaotic action in the best way, making it – for this writer’s money – the best one round fight of all time. It gets to a point pretty quickly where either man could have been knocked out cold at any moment. This pace was Diaz’s modus operandi. He frequently engaged in fights that you knew were never gonna let up for a moment. Unless, of course, he was fighting GSP, but we can hardly blame Nick for that can we? What is the definition of art? If it isn’t the expression of individuals for the consumption and – hopefully – the enrichment of others, then what is it? Fighting, for me, is the ultimate and most dynamic prism through which to view people. Their characters, their flaws, their strengths, their wills, wants and needs. In July of 2015, Robbie Lawler and Rory McDonald stepped into a cage and endeavoured to best one another in an athletic competition in order to secure the UFC welterweight championship of the world. What followed was the purest form of expression two humans could hope to produce. Both men bared their souls to the world on that night. It’s difficult to put into words what one draws from watching such a display, but I feel that I understand the world a little better having seen these two fighters drain themselves in the name of prosperity and legacy. Fights often reach a point where technique and skill level are relegated to the background, and heart, grit and desire – the humanity in all of us, trained fighter or otherwise – takes the centre stage. Robbie Lawler and Rory McDonald are two men who don’t know how to quit; who don’t know how to give anything other than their best. When the final bell rang I felt I knew these men far better than I did before the first bell rang. Robbie Lawler took a beating, but wouldn’t, nay, couldn’t give up. 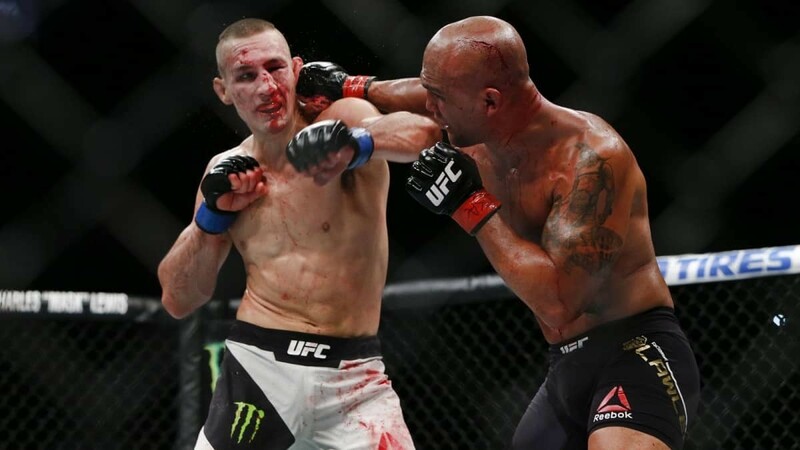 Rory MacDonald, despite his toughness and determination couldn’t make his body keep up with his will power. He crumbled to the floor, weighed down by his blood and sweat. With a battered but victorious Robbie Lawler standing over him. 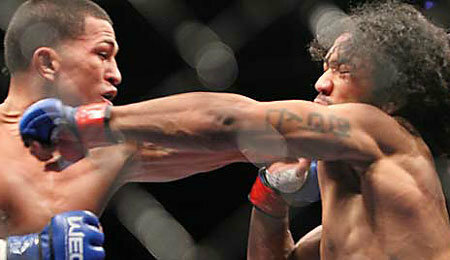 Both fighters are skilled, but it was sheer resolve that created such a memorable display that bloody night in Vegas. I felt I understood both men better after watching this, and in turn, understood what it takes to be the best version of yourself. If that isn’t art, then what is? Thanks for reading. Hopefully I’ve given that person you know, or even you, the reader, some food for thought. Let us know if you have any suggestions relating to the topic.